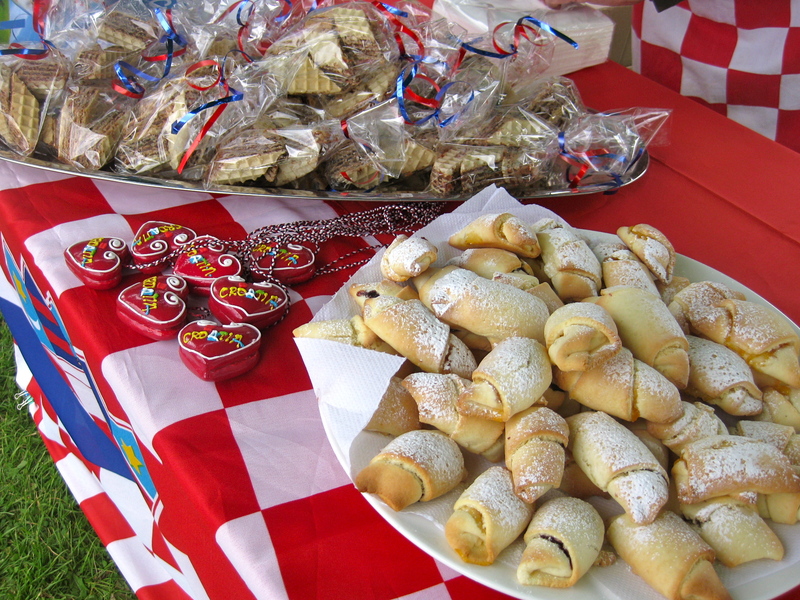 Well, I am pleased to report that our Croatian food stall at the Summer Fair was a resounding success. I’d been having restless nights leading up to the day…I’d been anticipating (I won’t say ‘dreading’) it ever since I signed up for it, knowing it would be a big day. I’m one of those people who can’t do something half-heartedly. I have to throw myself into everything. I imagine it’s hereditary because I know someone else like that. Dad had said he would help with the BBQ and Mum said she’d make oblatne for the stall. On the day, they turned up with 3 slabs of oblatne, 2 x BBQs and a bag full of kifli dough and 4 jars of jam. Apparently mum decided she’d make kifli as well. I had to clear out the kitchen while she baked trays and trays of these Croatian jam biscuits after weeks of trying to perfect the recipe. The butter and flour is different here, and she’d been having trouble getting it right. Well, she got it in the end and felt it was a good idea to sell these on the day as well. So my tiny house was buzzing with activity and my fridge was bulging with boxes of cevapi. Me and VC sliced and bagged diamonds of oblatne while mum took over the kitchen baking kifli. Dad had to find space for slicing up bread rolls and dicing onion. It was chaos. Like I said, we’re a family that doesn’t do thing by halves. After loading up the cars with stuff, we eventually found our gazebo and set up. England was not going to pull a sunny day out of the hat for us unfortunately. It was overcast and windy. 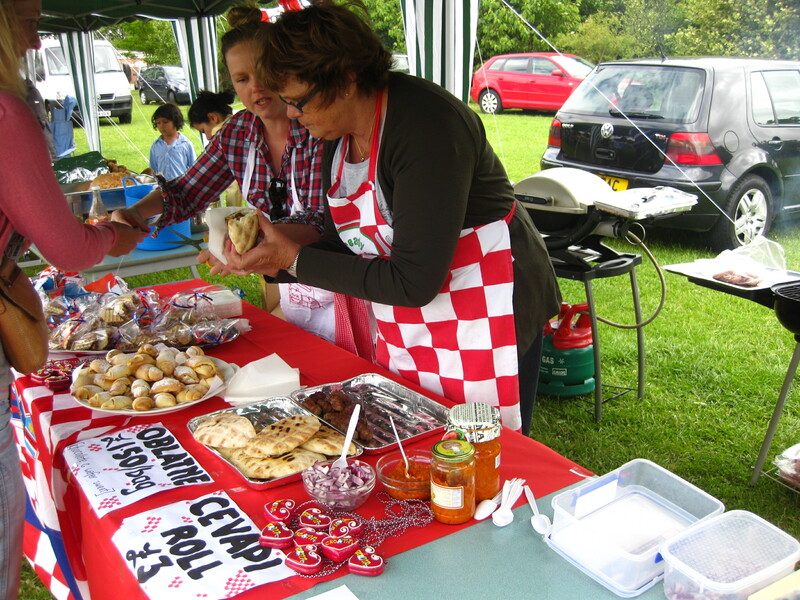 Nevertheless all the other parents and restauranteurs braved the wind and set up their stalls for the International Food Fair – including stalls of Thai, Japanese, French, English, Indian, Norwegian, Italian and Romanian. It was really lovely to see everyone put in such effort. There were bails of hay around the field, inflatable rides, stalls for smashing crockery, silent auctions and all the usual fair fare. Aside from a few light showers that only lasted a minute, the weather held off and the sun even came out for a peek throughout the afternoon. The sales were slow at first. We glanced enviously at the Thai stall next to us who were going gangbusters from the start. 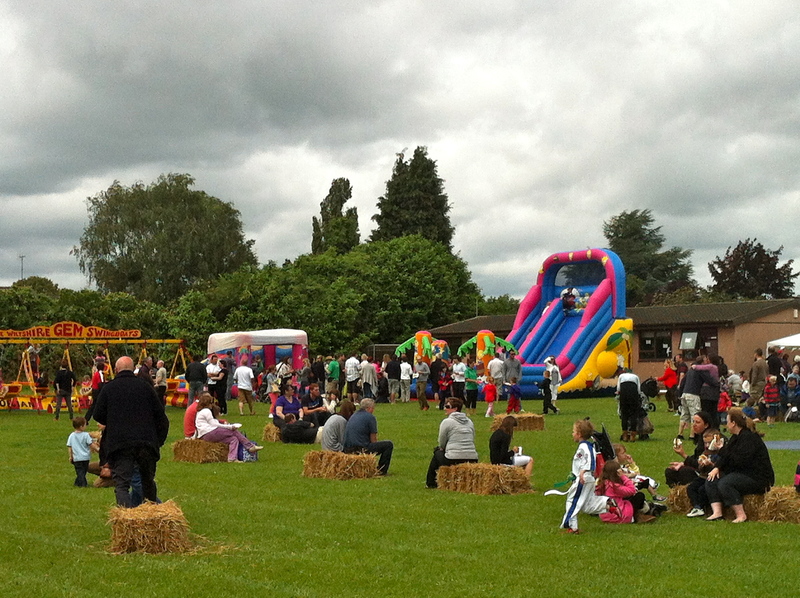 However, as the fair got into full swing our stall became very popular. I’d heard there was a buzz and people kept coming and returning for more. We had to turn people away at one point while we waited for more cevapi to cook. It was crazy. I had flash backs of my days in the cafe, and remembered why I am not cut out for service. I can’t handle the pressure! By the end of day, we’d just about sold out of everything. It was wonderful. We worked hard and raised about £120 pounds for the school. Everyone had a really nice day, spending the time together and having pride in the food we sold. There’s no way I could have done it without the whole family.